We have a shot at history this evening: another married couple of Jeopardy! champions. 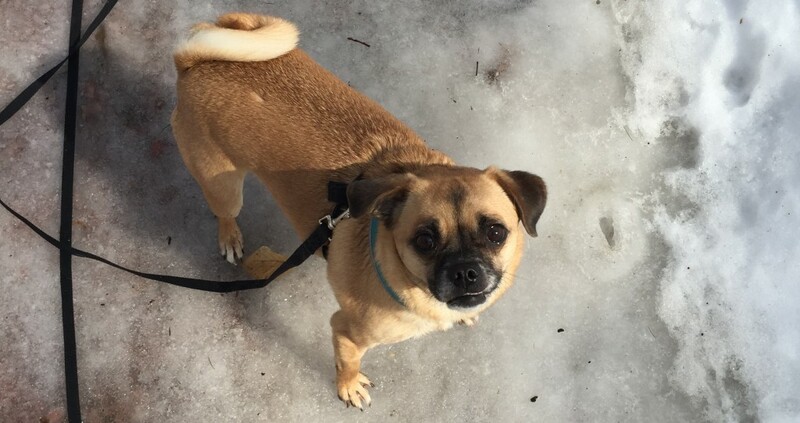 In tonight’s photo, we have another of my parents’ canines: Abbey, a chihuahua-pug mix. She won “best kisser” at the Green Mountain Pug Rescue Pug Social two years straight. After our first runaway in a while, we’ve got another good one tonight. Kristin entered the Double Jeopardy! round with (-$200), but ran the first category on films to get up to $5,800. I was hoping she’d make a True Daily Double of that second-level lit clue, but it’s easy to get cold feet under the lights. I’m guessing our players will be hip to this one. If Penny doubles her score, she’ll have 24,800. 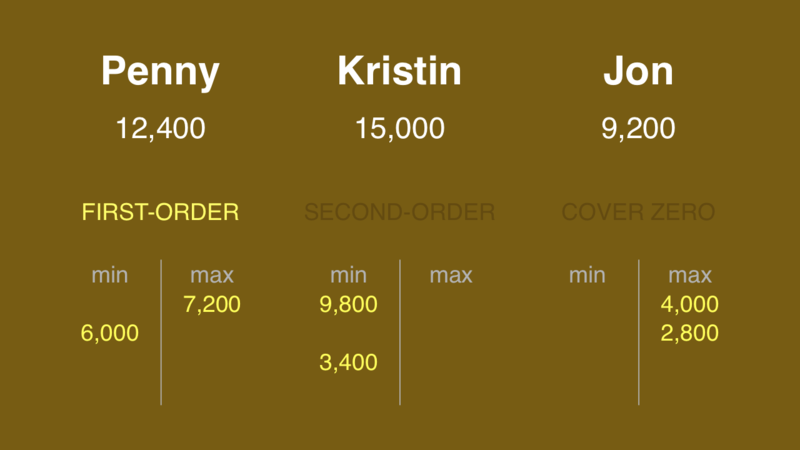 To cover this all-in wager, Kristin will need to wager 9,800. 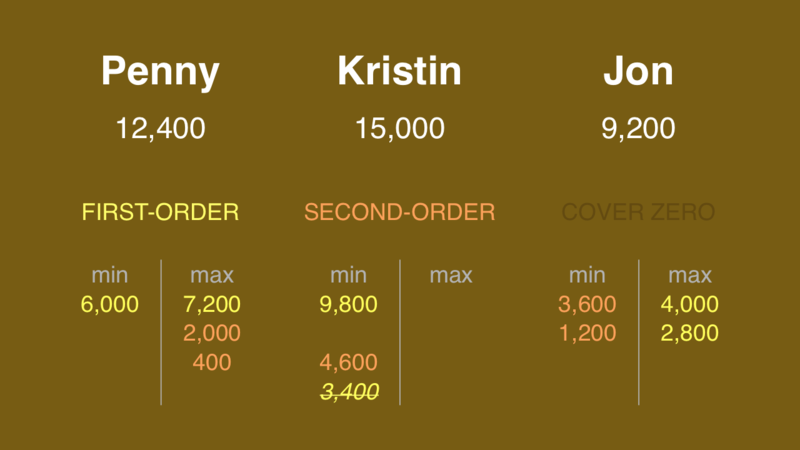 An incorrect response with that wager will leave Kristin with 5,200. To stay above her total, Penny can wager up to 7,200. Jim can wager up to 4,000. A successful doubling will put Jim at 18,400. To cover this, Penny should wager at least 6,000. If Penny is incorrect with that wager, Jim can wager up to 2,800 to stay above her total. 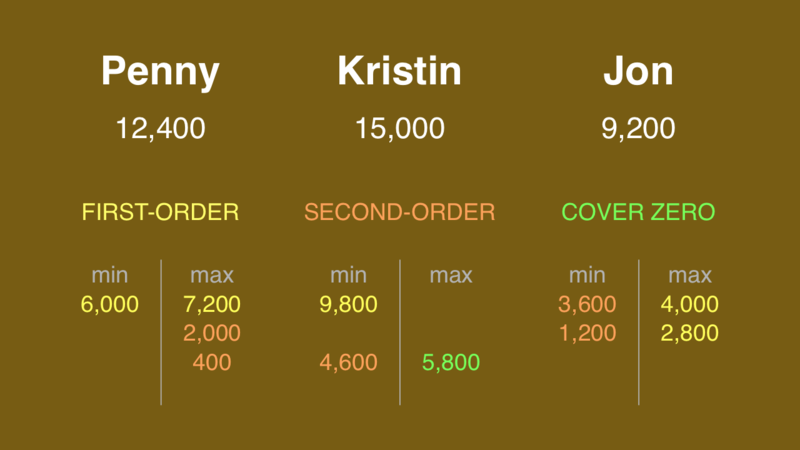 If Penny makes the rational maximum wager of 7,200, Kristin will need to wager 4,600 to cover her. If she’s wrong with that wager, she’ll be left with 10,400. To stay above her, Penny can wager up to 2,000. Jim might consider risking at least 1,200. I’m going to pick the more conservative of Jim’s wagering options. 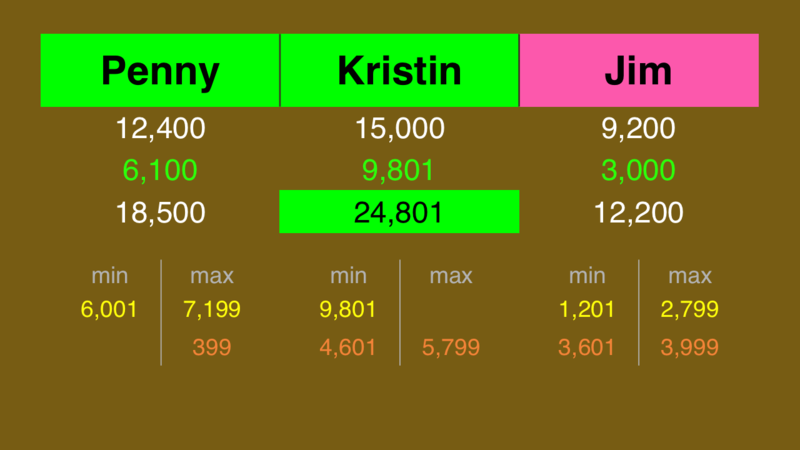 Against Penny, Jim can wager at most 2,800. With a correct response, he’ll have 12,000. To stay above this, Penny can wager at most 400. If she is correct, Penny will have 12,800. To account for this, Jim will need to wager at least 3,600. Jim needs to cap that wager at 2,799 – he would have lost by $100 had the clue been a triple stumper! All around, a solid game – yet the carousel spins on. Maybe Kristin got some tips from this guy on how to put together a monster run. We’ll find out tomorrow! By the way, Dan Pawson and his wife, Andrea Saenz, are both Jeopardy! champions. Who is “Weird Al” Yankovic? Tonight’s game is a nice segue into a controversy associated with a show that hasn’t aired yet but that blew up for a while on the internet. Two of tonight’s contestants spelled Al’s last name incorrectly but they were awarded a “correct” anyhow. So what is the “spelling” rule on FJ? I presume it is that if the misspelling could reasonably be pronounced identically to the correctly spelled response then it is scored as a correct response. Am I right? That’s correct – as long as pronunciation is unchanged, any spelling works.